UPDATED: Tue., Feb. 6, 2018, 6:45 p.m.
SEATTLE – When I pitched this column, an editor inquired as to what, exactly, I was inhaling recreationally. Even with the four-game winning streak, the program’s biggest victory in seven years and a Dance-worthy résumé, this idea still sounds loony to some. But should it? Is the concept that far-fetched? If I were to tell you that the Washington men’s basketball team has a legitimate shot at the Pac-12 title, would you call for my lobotomy? Well, you shouldn’t. If you’re a Huskies hoops fan, it’s OK to get greedy. UW winning the conference isn’t probable at this point, but it is a realistic possibility. Perhaps more realistic than most people think. As it stands, the Huskies (17-6, 7-3 conference) are in third place in the Pac-12. Arizona’s 9-2 conference record has the Wildcats 1 1/2 games ahead of them, while USC is one-half game up at 8-3. But if you look at those teams’ remaining schedules, Washington seems to have the least turbulence. Up next for the Huskies are Oregon and Oregon State, which hold Pac-12 records of 5-5 and 3-7, respectively. Moreover, the Ducks’ and Beavers’ RPIs stand at 95th and 184th, far lower than the Huskies, who sit at 38th. UW then hosts Utah and Colorado (56th and 64th RPI), travels to Cal and Stanford (183rd and 80th) then wraps up the season with Oregon and Oregon State at Alaska Airlines Arena. As for Arizona, it has home games vs. USC and UCLA (44th and 54th), then travels to ASU (43rd) before finishing the season against the Oregon schools plus Stanford and Cal. USC still has games against Arizona, ASU and UCLA, all of which have better RPIs than any of UW’s remaining opponents. Assuming the Huskies are as good as the top of the Pac-12, this appears to be the most opportune time for them to make a run up the standings. But are they as good? The “no” contingent would point to all the close games Washington has won all season. In contests decided by five points or fewer, UW is 7-0 and 3-0 in conference. You can argue this reflects the poise first-year coach Mike Hopkins has instilled in his players. You can also argue that the Huskies have been damn lucky. The beauty of the NCAA Tournament is that basketball so often comes down to a recovered loose ball or banked-in 3-pointer as the shot clock expires. The Huskies had two of the latter in Saturday’s win over then ninth-ranked Arizona. Logic says the coin will eventually start landing on tails and bring Washington back into the middle of the pack. 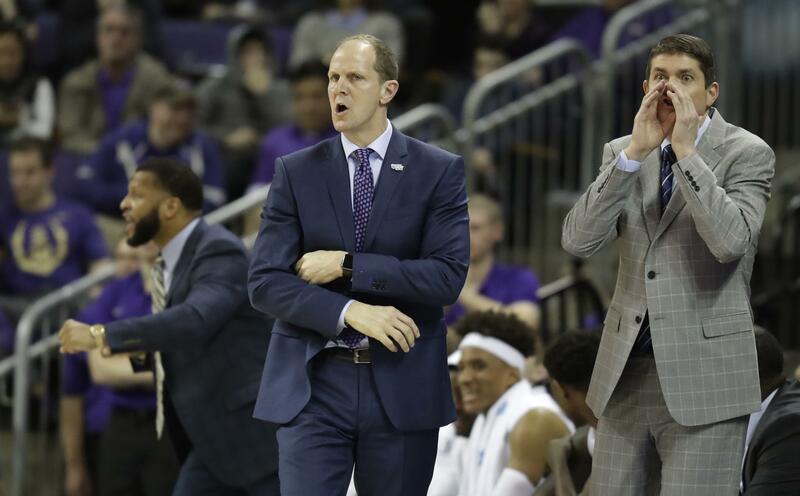 But considering Washington is 3-0 against the teams with the highest RPI in conference – and 2-0 against teams ranked in the top 10 nationally at tip-off – logic also suggests there could be some double-digit victories on the horizon. For one, UW’s defense can keep it in nearly every game. The way it has taken away the 3-point ball has been spectacular for stat geeks. The Huskies’ 26.8 defensive 3-point percentage in Pac-12 play is easily the best in the conference. Plus, they’ve allowed the second-fewest 3-pointers as a percentage of all opponents’ field-goal attempts. I know, that’s a Nerd City stat – but it basically means that opponents can’t get 3-pointers off against the Huskies, and when they do, they miss. And on offense, Washington has found an ever-reliable scorer in forward Noah Dickerson, who was named NCAA Player of the Week on Monday. Scoring 25 points against two 7-footers Saturday, the (essentially) ambidextrous junior proved that he can provide a bucket whenever he gets the ball in his hands. Hopkins is the front-runner for Pac-12 Coach of the Year, but don’t think he doesn’t have talent. His predecessor, Lorenzo Romar, was one of the conference’s best recruiters, and many of the players on this roster were highly coveted. It’s just that, this year, their potential is being tapped, and Hec Ed has become one of the better Pac-12 atmospheres as a result. Look for that to continue. There is nothing fluky about what the Huskies are doing. They’ve had some fortunate bounces, yes, but most of their success is because of a combination of buy-in and natural ability. If you’re a fan, you should appreciate that they’re in third place, but you don’t have to settle for that. This year’s Huskies are better than anyone could have imagined, but there still might be better things to come. Published: Feb. 6, 2018, 5:19 p.m. Updated: Feb. 6, 2018, 6:45 p.m.